You have big goals for your business and so do we. As your partner, we’ll create an eye-catching, customized website based on your industry and tailored to your brand. All of our websites are built to fit around your business needs, including incorporating your logo and signature colors in the website design. 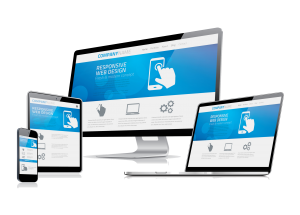 Our websites are also responsive, so no matter what device your next customer is using, they’ll have a great user experience and find out more about what your company has to offer. Website content is written with your brand promises and industry in mind. Our easy to navigate web design will quickly provide your customers with solutions. As your company grows, your website needs may change. An outdated or generic website no longer makes the cut for a growing business in a competitive environment. Let us know your vision for all that your website could be and we’ll provide the solution!